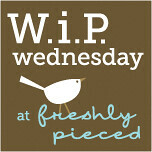 alidiza: W.i.P Wednesday: Up Too Late! After whining to everyone and their cousins about how much I hate basting I finally got over myself and just did it. Why I finally decided to do it when it was 90° here I just don't know. It really didn't take that long but I was a hot, sweaty mess! Unfortunately I ran out of safety pins. After digging around in my studio for some more I realized they were all stuck in UFOs. I dragged this Lil' Twister out of the pile and decided it was time to start quilting it. The quilting is the Paisley design from the fabulous Free-Motion Quilting with Angela Walters. This book is amazing, definitely one I'll be using frequently!!! I'm trying to keep my copy pretty so I can have it signed when Angela comes to visit the BMQG in September but I can't stop looking at it. I may have to buy another copy;-) Hopefully I won't have to stay up too many nights to finish this so I can reclaim all those pins and get my quilt off the living room floor before little feet start walking on it! 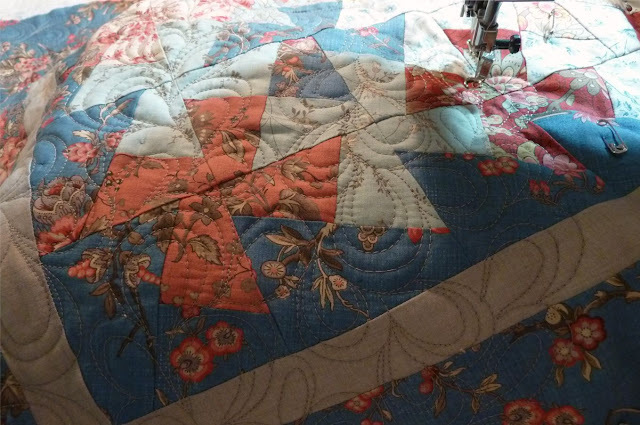 What beautiful machine quilting you do!